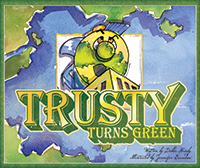 Trusty Turns Green is part of the Children's Collection. Trusty just isn’t himself when a new guy comes to school. Why is it so hard for him to feel happy? But hardest of all—Slick was winning his friends! From Susan Lamb of Gibson, Georgia on 4/13/2017 . I have purchased the entire Trusty series for my grandchildren. They love them! The stories are good and teach good lessons. The artwork is great also.